Tracing the handwritten notes on the slightly yellowed page in the old exercise book from Car Distributors and Assemblers (CDA) with "W121 Ponton, first production 1958" on its cover, the finger of Norman Hickel suddenly stopped on the fourth line of inscription on the first page. With his forefinger firmly placed, Hickel triumphantly looked up and showed the line of figures to the small group of bystanders. "Here it is," he excitedly said. "The dates, the places, the numbers, everything …"
According to these original records kept by the Mercedes-Benz plant in East London, the first locally assembled Mercedes passenger car was a W121 Nap Vista Blue Mercedes-Benz Ponton that came off the line on 31 January 1958, sixty years ago. Three other cars were ordered ahead of this Ponton, and they are listed first, but according to the official list of cars coming off the line, they only went through final assembly in February of the same year. The first Ponton was dispatched to John Williams Motors in Bloemfontein. 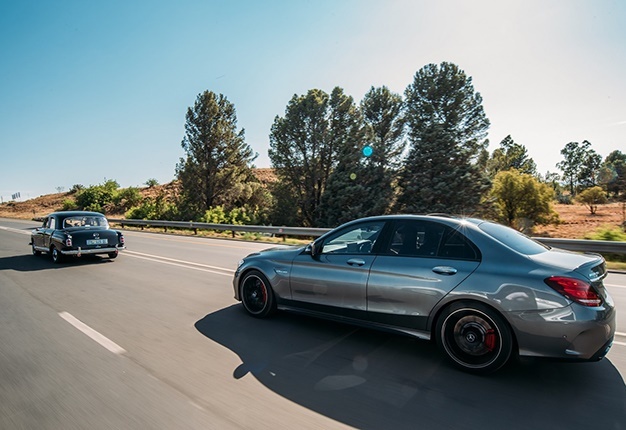 Exactly sixty years later, on 31 January this year, Mercedes-Benz South Africa announced that the first example of the locally built Mercedes-AMG C63 sedan – the fastest production saloon in the country – has rolled off the assembly line in East London. 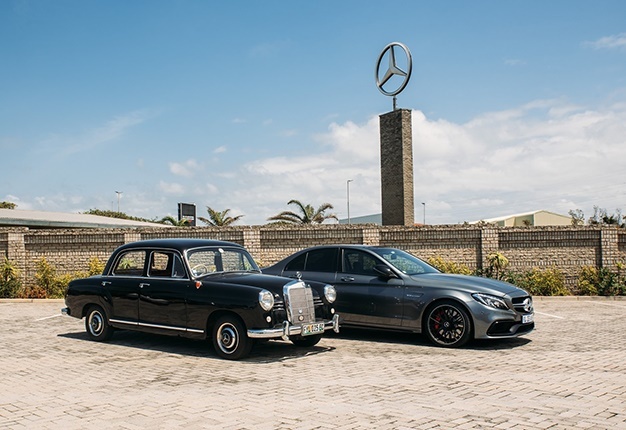 So, we sourced a locally assembled Ponton and a 2018 Mercedes-AMG C63 S to undertake a journey that followed the tyre tracks of the first Ponton from the plant in Buffalo City to Bloemfontein where it was delivered in February 1958. Erald Hohls, chairman of the Mercedes-Benz Club in the Eastern Cape, kindly made his immaculate 190 Ponton available for the trip and suggested we ask fellow club members Normal Hickel and Pieter Moolman to undertake the journey with the W121 – accompanied by a C63 S sourced from Mercedes-Benz South Africa (MBSA). 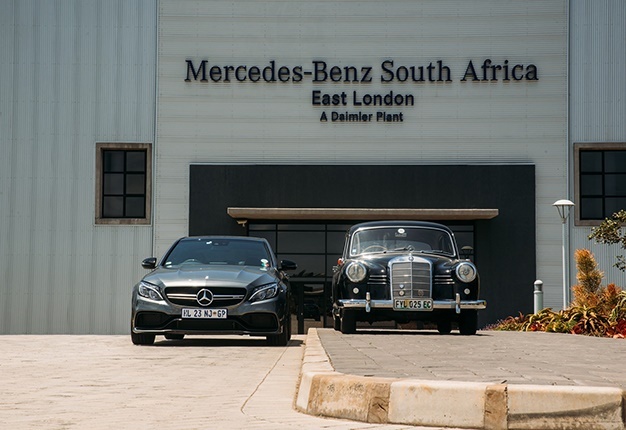 We received both the Ponton and C63 S at the plant in East London and parked neatly next to the modern AMG the old W121 still looked elegant and stylish, despite its age. Mr Hickel, who worked for MBSA for 22 years, turned out to be an indispensable source of information. He explained the origins of the Ponton name (the German word for pontoon, describing the unibody and fender construction of the W121) and the production timeline of the predecessor of the modern-day S-Class – quite difficult to believe when one compares it to the latest C-Class in terms of size … After leaving the plant, we first did a couple of laps on the (public) roads forming the East London Grand Prix circuit. Over the years MBSA had a huge influence in the running and maintenance of the track, and it was also our last chance to unleash the 375 kW of power and massive 700Nm of torque of the mighty M177 4-litre V8 of the AMG before meekly following the Ponton up North. We also spotted a facelifted C63 S, now with the new Panamericana grille first seen on the Mercedes-AMG GT R, that is set for local release soon before taking the R346 to King Williamstown, as this was the original route leading to the interior. The Ponton serenely puttered along at between 90 and 100km/h, with the AMG following sedately, its twin-turbo motor burbling restlessly … After King Williamstown, we joined the N6 close to Stutterheim and then made good time towards Cathcart and Queenstown, where we filled the 58-litre tank of the Ponton for the run towards Aliwal-North. Still, its 1 897cc four-cylinder engine that produces 37kW and 108Nm delivered enough torque to maintain a steady 80km/h on slight inclines, and its balloon-type 13" tyres handled potholes better than the wide low-profiles on the C63 S … Its overall ride quality, while floaty, was surprisingly good, but there were virtually no brakes (you really needed to push those drums very hard before it had any effect). 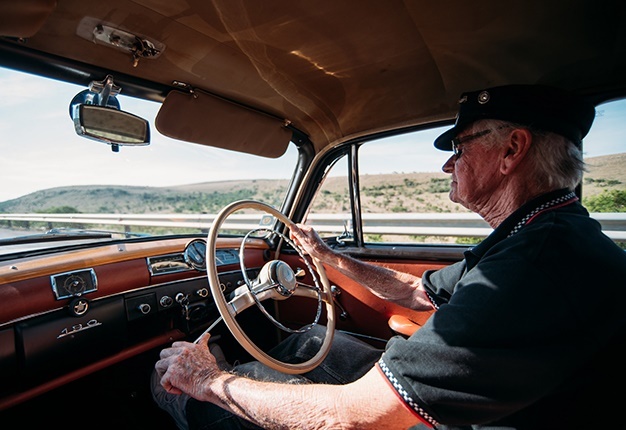 After reaching Aliwal-North without trouble and crossing the bridge over the Orange River into the Free State province, the long, hot tarmac stretches past Reddersburg started to take its toll. The Ponton was overheating, and it took hot and hard work to keep it going for the final stretch towards Bloemfontein. A quick tow with our Vito backup vehicle got the W121 running again, and although spluttering and stuttering, it made the last few metres to the showroom, with the AMG, aircon on high and still burbling contently, following it to a warm welcome from the dealership staff. 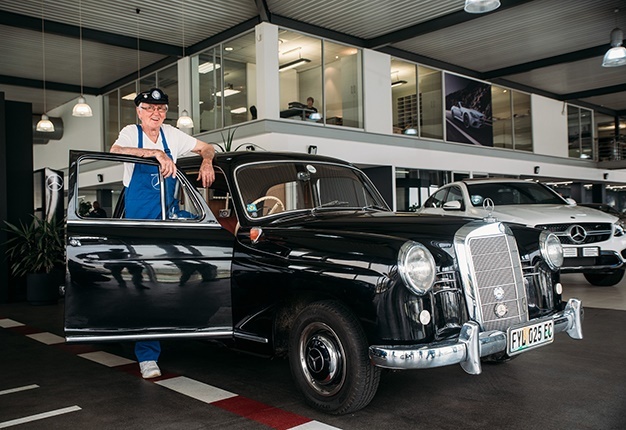 It was clear the old-timer needed some loving attention after its long trek, and luckily it was in good hands, as over six decades ago John Williams Motors was one of the first franchises of the then Mercedes-Benz Motor Importers (MBMI) to sell, distribute, and service Mercs in the country. 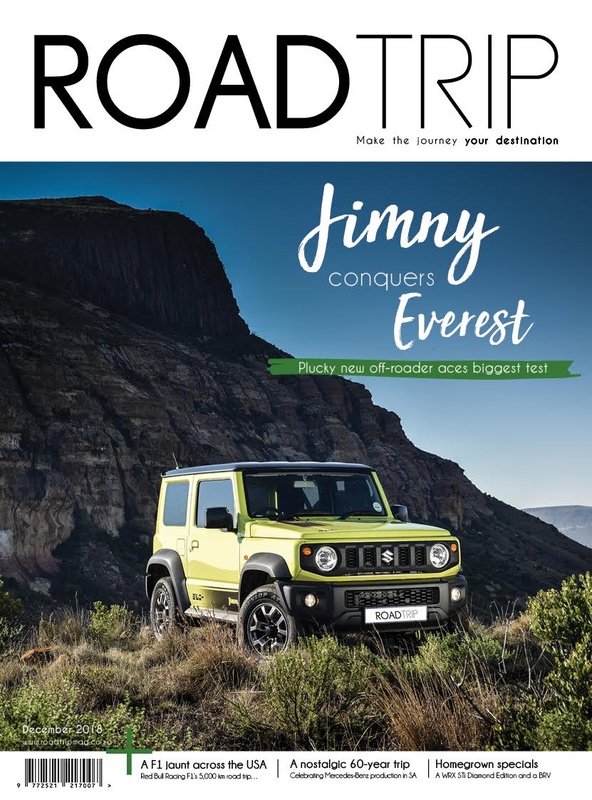 It was a most enjoyable trip, and besides highlighting how easy car journeys have become over the past sixty years, it again proved the reasons why after more than six decades Mercedes-Benz is still such a revered brand in South Africa. *Our sincere thanks to Erald Hohls, Norman Hickel, and Pieter Moolman from the Mercedes-Benz Club Eastern Cape, as well as Klaas Kotze, dealer principal, and Jako Schoeman, public relations officer of John Williams Motors, and Mercedes-Benz South Africa for their assistance with this project. Also look out for the video of the road trip on the social media channels and website of Mercedes-Benz South Africa.